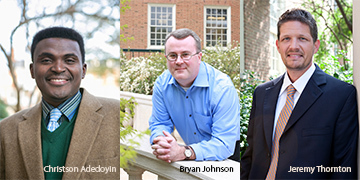 Samford University professors in three distinct fields have been named inaugural recipients of faculty grants from the William E. and Wylodine H. Hull Fund for Christian Scholarship. Recipients are social work professor Christson Adedoyin, honors programs director Bryan Johnson and economics professor Jeremy Thornton. According to Associate Provost for Academics Chris Metress, the three will share a total of $27,900 to pursue projects that underscore the fund’s purpose to strengthen Samford’s Christian character and institutional purpose. The intent is to systematically synthesize peer-reviewed publications and conference presentations to identify the most effective pedagogical models of integrating faith and spirituality in a social work curriculum, specifically, and education in general. “The project will contribute extensively to the pedagogy of integrating faith and spirituality into social work education and the training of the next generation of Christian social workers, practitioners and educators,” said Adedoyin. He expects to share the findings with Samford colleagues in on-campus presentations, and with a broader audience of social work students, practitioners and educators in Birmingham and at national and international conferences. Several Samford social work students will serve as graduate research assistants on the project. Johnson, who directs Samford’s University Fellows and Micah Fellows programs, will use his grant to help plan and host the university’s second biennial Teaching the Christian Intellectual Tradition (TCIT) conference. Samford’s first TCIT conference, held in 2014 with the support of a Lilly Fellows grant, focused on teaching Augustine across the curriculum. It drew 81 participants from 39 universities. The 2016 conference, with a theme of “Teaching the Reformations,” will be a collaborative project involving the University Fellows Program, the Samford Center for Teaching, Learning and Scholarship, faculty from across the university, and colleagues from colleges around the country. “The purpose of this conference is to provide an opportunity for faculty, specifically nonspecialists who teach in the rich Christian intellectual tradition, to share ideas and classroom practices,” Johnson said. Thornton will pursue “Paying for Paul: An Economic Analysis of International Mission Funding Strategies,” a comparative economic and historical analysis of strategies used to recruit, deploy and maintain missionaries. By aggregating archival data from groups such as Roman Catholic, Southern Baptist and Methodist churches into a single repository, Thornton will examine the relative productivity and sustainability of different financing methodologies. He hopes to determine if some organizational strategies are better suited for producing and sustaining international missionaries, how those structures have changed over time, and if there are long-term social and economic forces that help explain trends in missionary funding. The project is a joint effort with David King, a Samford history graduate who is a professor and director of the Lake Institute on Faith and Giving at Indiana University’s Lilly Family School of Philanthropy. “We expect that our findings will be of significant value to missiologists, church leaders and future missionaries,” said Thornton, who is social entrepreneurship program coordinator in Samford’s Brock School of Business.